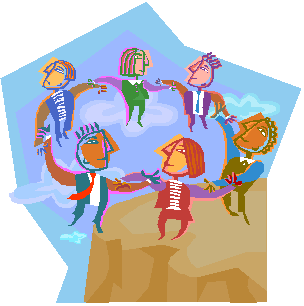 has to engage with the experiences and knowledge that they will be bringing to that particular learning situation. Overall, the process of developing LOs with students has to engage them in thinking about and reflecting on themselves as learners and the learning journey that they want to take. progression towards larger learning goals. 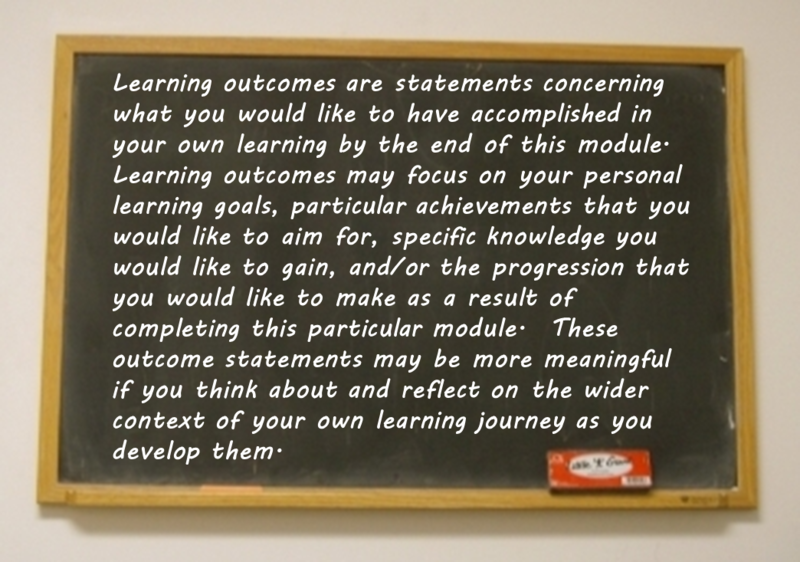 These learning outcome statements may be more meaningful if you think about and reflect on the wider context of your own learning journey as you develop them. Of course, the real test of this definition is whether students like it and, more importantly, whether it is meaningful for them and encourages them to engage in a meaningful learning activity. We are now in the process of carrying out just such a test with a variety of students and student groups. I can though report that our first trial of this definition with some final year students in a session a few days ago had some very pleasing results. In the first session of a new module we introduced the students to the formal LOs for the module, then explained our interest in developing LOs in collaboration with them which would focus on their learning within the module and how that learning fits into the broader context of their courses and their personal learning goals. We reviewed our student-focused definition of LOs with them and asked if they could identify any of their own LOs in the form of personal learning goals, particular achievements they are aiming for, etc. Far from being challenging, most of the students were able to articulate some very personal and unique goals that not only related to their interests and learning experiences from other modules, but also connected to their overall ambitions and reasons for choosing the courses that they are doing. 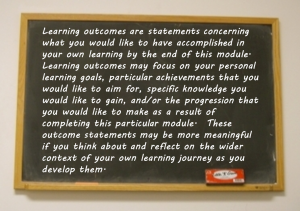 It all confirmed to me that we are on the right track with our definition and that engaging students in this kind of explicit thinking about the outcomes that they want to achieve will potentially have some powerful and positive effects for them. I will keep readers updated about our further tests of this definition and the other activities we are conducting to explore how students can be effectively engaging in developing learning outcomes. In the meantime, I will be very interested to hear any thoughts that you may have about the definition and if you have tried it out with your own students.